The Arlington Food Assistance Center (AFAC) Young Professionals is throwing their 3rd Annual "Hunger is No Joke" event, with all the proceeds benefiting the AFAC. Hunger is No Joke 2013 will feature live music from Over the Line, two free drinks with each ticket purchase, and complimentary appetizerse from 8 to 10pm. It also features a silent auction, as well as raffles for cash and prizes. The event takes place on Friday, April 5th from 8 p.m. to 12:30 a.m. in Cafe Asia's Party Loft (located behind Cafe Asia in Rosslyn). Tickets purchased in advance are $25 for single tickets and $45 for a pair of tickets. There will be food specials, raffles, and drink offers including $2 Yuengling and Yuengling Lights, $3 Rails, $4 Shamrock Shots and $5 Irish Car Bombs. Tickets are $17 online or $22 on event day. 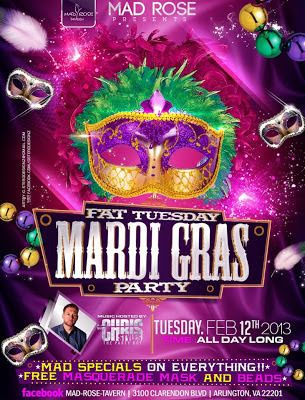 Mad Rose is hosting a charity benefit party on Tuesday, March 12 for the American Autoimmue Related Diseases Association. From 6 to 11pm there will be a DJ, raffle, silent auction, free appetizers and special guest speaker Stacy Toth the aurthor of "Eat Like a Dinosaur and Beyound Bacon." All net proceeds will be donated to the AARDA to support their fight against autoimmune diseases that effects one in five Americans. Tickets start at $30 and have to be purchased beforehand here. Tonight, one of my favorite bands from years ago is playing in the city at DC9. The little music venue on 9th Street NW has an upstairs dance floor where Snowden will be appearing at 9pm. I loved their bass beats and airy tracks such as Like Bullets and Anti-Anti from their 2006 album. 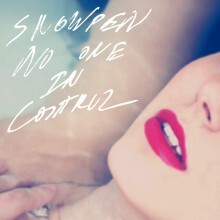 This DC9 will feature songs from their newly released second album "No One In Control." Tickets are only $10 and you can buy them online here. ﻿This Thursday, Feb 21 Wilson Tavern is throwing a party to celebrate its new interior after expanding into the empty space next door. 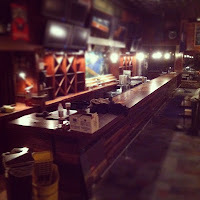 The new bar was open last week, and those that visited like Missy say it is "feels MUCH larger. Menu looks good. Pierogies are awesome. Bartenders are attentive. Great experience so far!" The spot that used to be Kitty O'Sheas now can hold many more people, and features larger TV's, darts, and a new food menu. 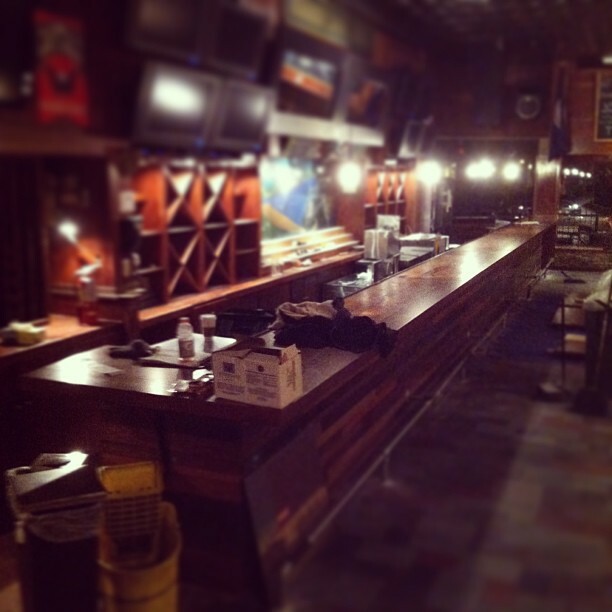 To officially break in the new place, Wilson Tavern is partnering with Guest Of A Guest to throw a re-opening party. 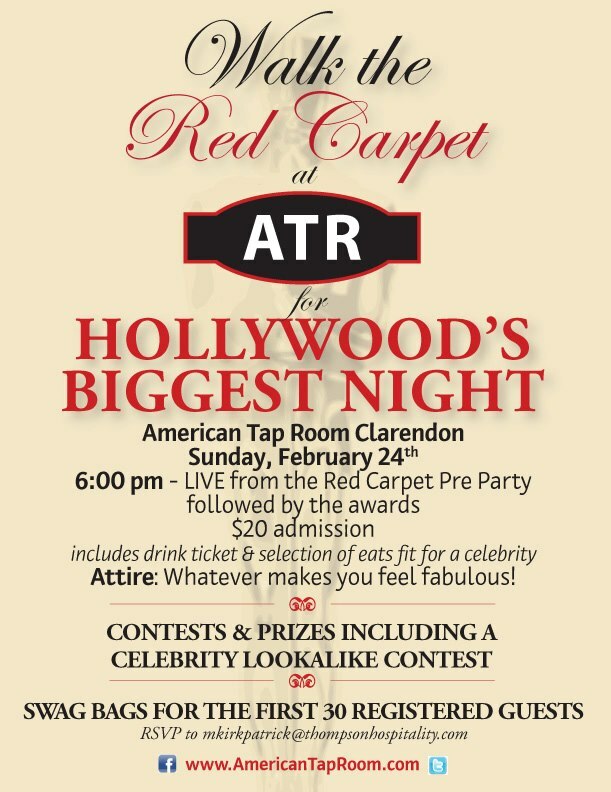 ﻿American Tap Room in Clarendon is having an Oscar viewing party this Sunday, Feb 24. 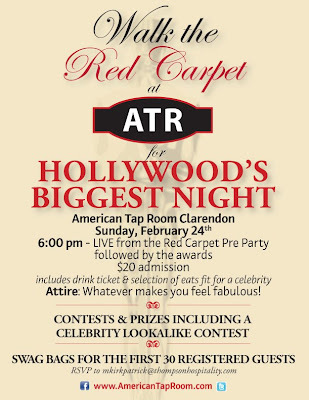 ATR will start out at 6pm with a Red Carpet Pre Party followed by viewing of the awards, along with a celebrity look-a-like contest. Tickets are $20 which includes one drink ticket and appetizers. Local favorite Jay's Saloon was recently noted on 88.5 FM WAMU's DC Dives feature. Jay's is getting ready to celebrate its 20th year in business in September, and WAMU interviewed its owners James and Kathi Moore and some regulars to investigate how it became the "last unpretentious place" in Arlington. Who knew Jay's had a trashy romance novel book exchange? No news to anyone, but Jay's Saloon future is uncertain. The building owners have hinted at tearing down the old house and adjacent car dealerships and build four story condominiums. I'm hoping this won't be anytime soon, as this low key bar that is litterally steps away from my home is a nice contrast to the typical Clarendon venue. The Nine Songwriter Series makes its monthly appearance at Iota this Tuesday, Feb 19. I've always loved this event that local musician Justin Tradwick puts together, as you get to see nine very talented artists in one night for only one cover charge. While most restaurants are booked to capacity on this popular night, you may be able to squeeze into Northside Social's wine bar. Set in their cozy upstairs bar that oozes romance, they feature a wine happy hour that is from 5 to 7pm and features two reds, two whites and one sparkling wine for $5 each. A cheeseboard and two glasses is $21. This little wine and coffee shop owned by Liberty Tavern also made the Washington Post's most romantic DC places! For a non-traditional V-day, try Arlington Cinema Drafthouse for their comedy night. Comic Rahmein Mostafavi weekly "Cool Cow Comedy Showcase" starting at 8pm. The show features multiple comedians in their small bar area and has a $5 cover. Then they are showing the classic Princess Bride movie at 7pm and 9:50pm. 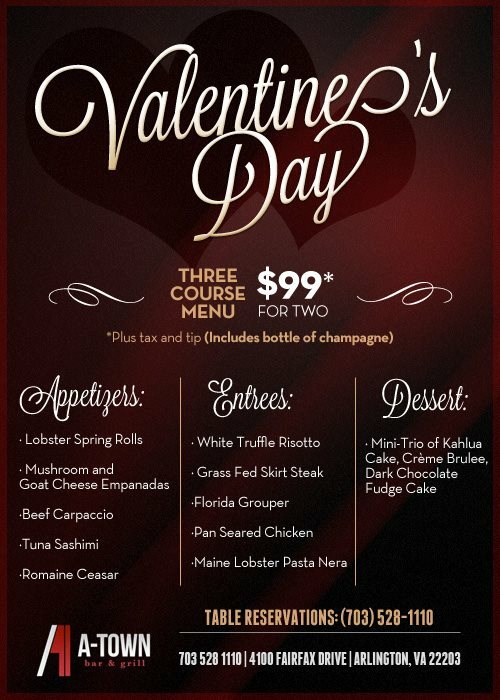 A-Town in Ballston has about five tables currently available for their $99 three course menu for two. This includes a bottle of champagne, see the flyer on the right for details. Eatbar is hosting an "Anti-Valentine's" day party tonight, featuring some drink specials and a homemade anti-Valentine's Card contest. Wilson Tavern is open again after expanding, and is throwing a Love Bites Valentie's Day party. From 8pm to midnight condoms & candy necklaces provided at the door, and I think if you print out this page you get two drink tickets. It's time again to raise your glass and help try break a world record! 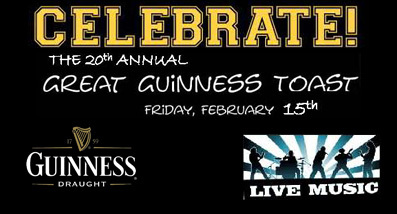 On Feb. 15, join other revelers at RiRa Irish Pub in Clarendon for the Great Guinness Toast. The event starts at 9pm with the goal of joining countless others around the world to clink your glasses together in an attempt at a Guinness World Record for largest simultaneous toast. 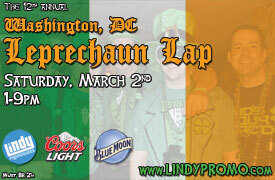 RiRa will also have a bagpiper on hand to kick off their countdown to St. Patrick's Day. 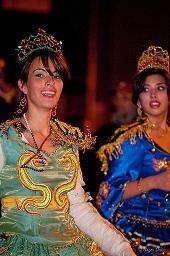 A few pictures from the family friendly 2013 Mardi Gras parade in Clarendon last night. For more photos, check out Dasha Rosato's Flickr album. Every Wednesday is trivia night at Clarendon Grill starting at 8pm. 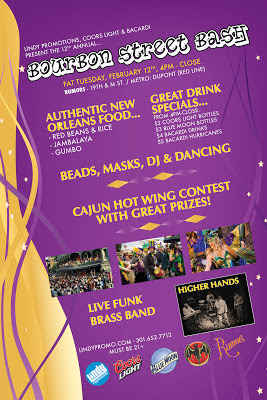 The night includes music, prizes and half price burgers. Since their renovation two years ago, the Grill's food has really improved and is actually very tasty. 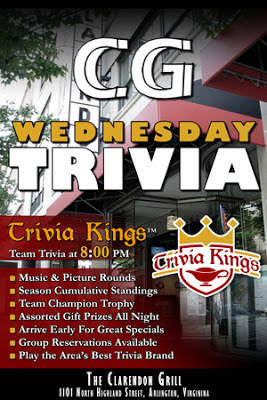 You can find more trivia nights in the DC area from bardc.com. 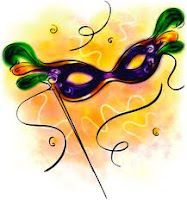 Tonight should be a fun night out in Clarendon with the annual Mardi Gras parade at 8pm followed with lots of drink specials at various local bars. RiRa is strategically placed in the middle of the parade route on Wilson Blvd and is celebrating with live music by Tommy Gann starting at 7pm. Beer specials include $3 Heineken and Newcastles until 9pm. 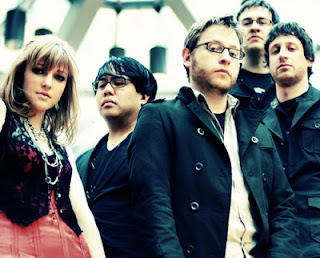 One of my favorite bands Juniper Lane is playing in Clarendon this Friday night. I've seen the five member band perform many times over the years and have always been excited about their performance. 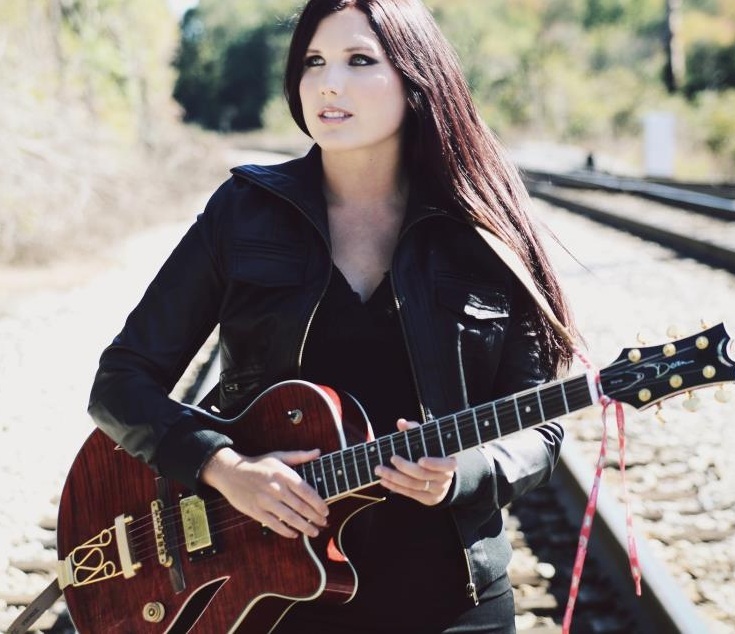 Their addictive rock beats mixed with lead singer Vivion Smith's mesmerizing vocals will rock Iota Friday starting at 9pm. The $12 cover also includes two other performances sharing the stage: Against Grace and Stella Mira. The L.A. sister trio band HAIM is invading the area this week and on tour in three locations. 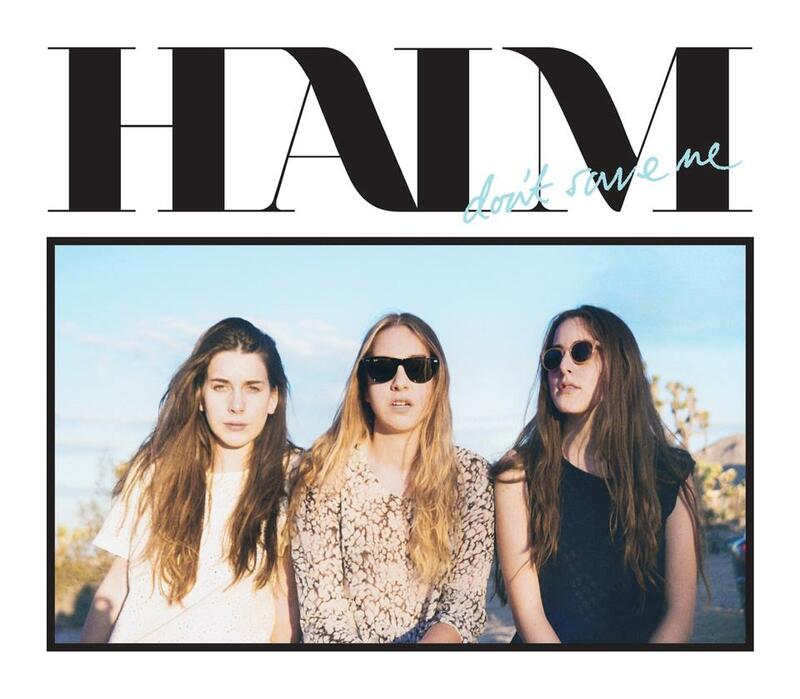 Alana, Este and Danielle Haim grew up in a family band, influenced by Kate Bush and Stevie Nicks as much as 90's R&B like TLC. They played at SXSW and toured with Mumford & Sons. They'll be releasing their debut full-length album in 2013 on Columbia Records. 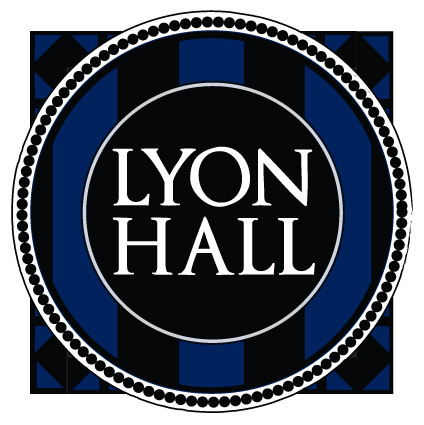 Their local tour includes two with Mumford & Sons at the Patriot Center (sold out) and Thurs Feb 14 11pm at the U Street Music Hall in DC. Tickets are $12 online, or $15 at the door. 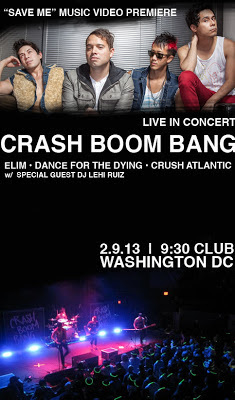 Local muscians Crash Boom Bang are playing at the 9:30 Club in DC Saturday Feb 9 evening. I first saw CBB play at a random event in Tysons 3 years ago and were impressed with their light rock / pop quartet sound. 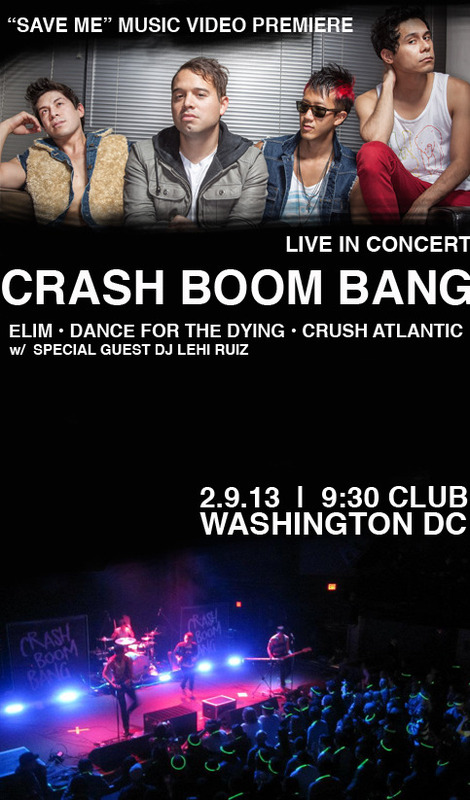 I'm happy they are doing well and are now head lining at one of DC's best music venues. Tickets are $15 here. CBB's after party is hosted by Night Life Agency at MidtownYou can get more updates from their Twitter feed here. Rhodeside Grill closed after the superbowl last Sunday for some quick renovations and plans to open back up tonight around 6:30pm. The Texas Longhorn alumni bar completely re-did their upstairs bar and dining booths. I really liked Rhodeside in the past, and am looking forward to their updated look. Their new menu will be coming out in a couple of weeks. ﻿One Common Unity benefit happy hour is happing tonight, Thursday Feb 7 at Gua Rapo. 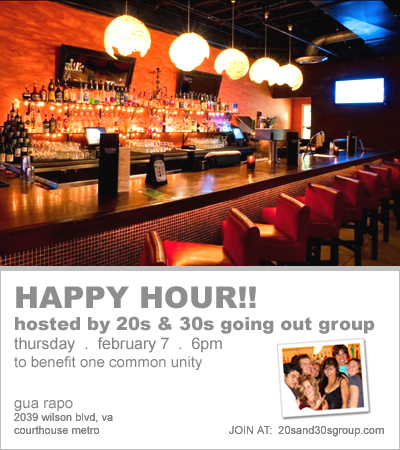 The non-profit's mission is to create sustainable communities, and 80% of the happy hour's proceeds will go to this charity. 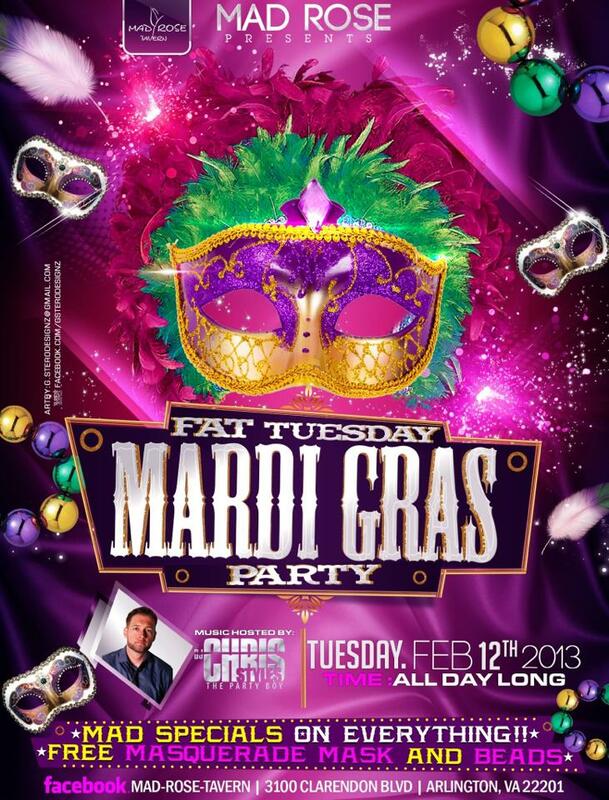 The event goes from 6pm to 8pm and includes DJ Saam, the 20 & 30s Going Out Group, $4 Corona Lights, $6 wine and of course hooka. So far over 300 people have signed up to attend so it should be a great turnout. Suggested donation is $10. Critically acclaimed Brooklyn indie rock group Great Caesar will be returning to the greater DC area to perform their unique brand of brass-fueled indie rock on Saturday, Feb 9 at the Iota. Also performing are locals The Nighttime Adventure Society, who will be celebrating their last show in the area before relocating to New York City. Cover is $10 and the show begins around 8pm. 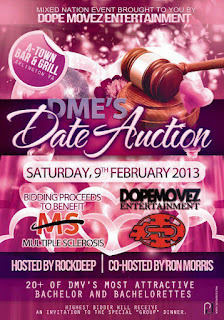 A-Town Bar & Grill in Ballston is hosting a fun Date Auction for a great cause this Satuday Feb 9th. 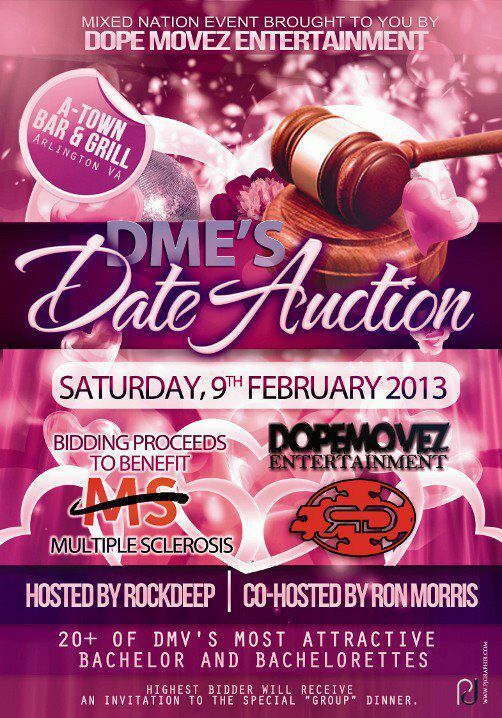 The auction will feature over 20 eligible men and women and will raise money for Multiple Sclerosis research. The event starts at noon and tickets are $10 at the door. If you can't attend, you can donate directly to the National MS Society here. 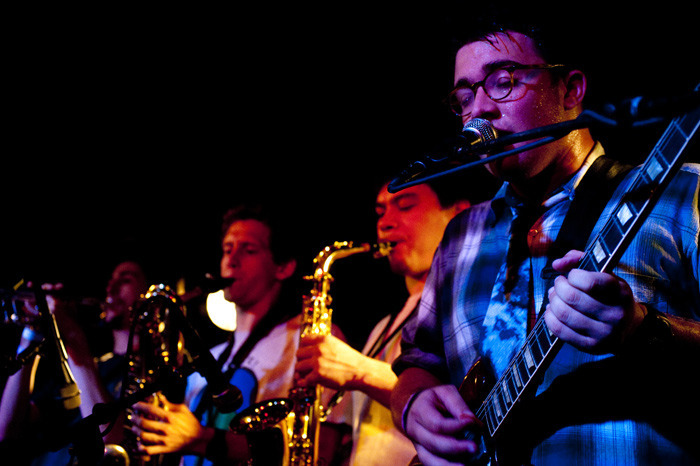 Onward Chariots is playing Galaxy Hut this Sunday, Feb 10. The 9pm show will host a range of musical styles from indie pop to garage rock. The continent hoping band has played throughout Europe, including several PopFests. You can preview their light hearted and Cake-like tunes with their music video Mel Gibson here. 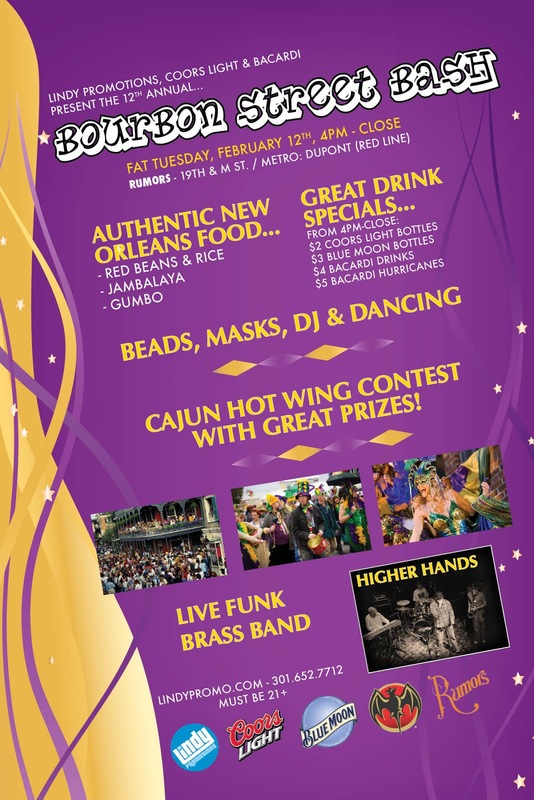 Mad Rose is hosting a Superbowl party this Sunday to benefit Cancer Cares. They will be raffling off prizes before the game starting at 1pm. Prizes includes 9:30 Club, Wooly Mammoth Theatre Company and Jammin Java tickets. Afterwards, Mad Rose continues their Super Bowl festivities with no cover charge, a $25 brunch buffet, and Capitals hockey ticket raffle. DJ Saam & Soleiman will be on hand playing hip hop and house in the back room. 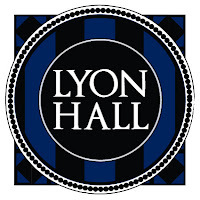 Liberty Tavern and Lyon Hall will again be participating in this year's Restaurant Week. 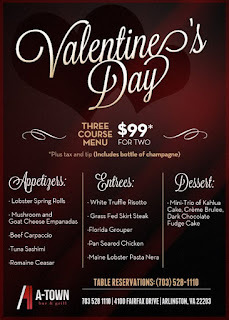 From Monday Feb 4 to Sunday Feb 17, you will have the option to choose a three course meal from their entire menu. Courses are a fixed price of $20.13 for lunch and $35.13 for dinner. 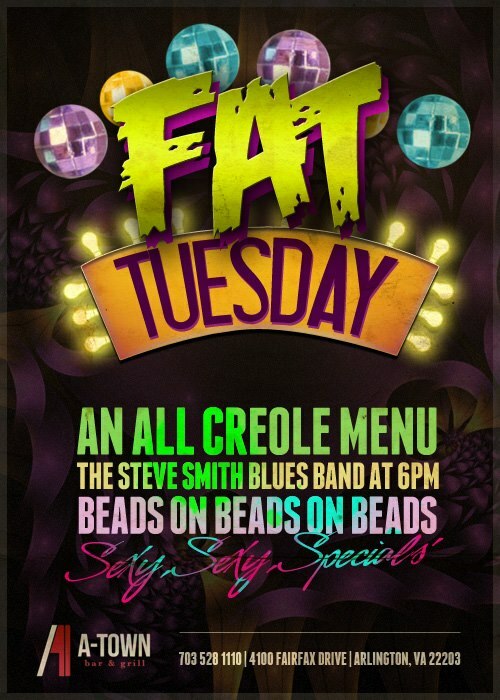 The special includes any appetizer, any entree and any desert from the regular a la carte menu. Both re﻿staurants are run by the same owners and are known for some of the best food in Clarendon. 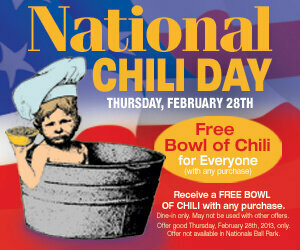 I suggest reserving a table via Open Table to secure a seat for the popular Restaurant Week deal.